One of the major concerns for any busy auto repair shop owner, mechanic, or technician is reducing downtime and improving efficiency. 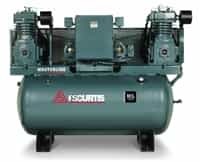 Whether you are due for an equipment upgrade or you’re opening a brand-new business, our selection of duplex air compressors offers a wide range of high-quality devices made by BelAire and FSCurtis for optimal performance. Unlike the two-stage air compressor, a duplex air compressor is designed with a set of two, equally sized pumps and motors for extra security in the event of pump or motor failure, repair, or applications that call for varying air usage. Explore our selection today to find the right solution for you, your needs, and your budget. Duplex air compressors have everything you need to tackle both low and high demand jobs. Due to the dual-motor design, the horsepower rating for any of the compressors we carry will always reflect the combined horsepower of both motors. For example, a compressor with two 5HP motors will have an overall rating of 10HP. One of the greatest advantages to choosing a duplex air compressor for your professional repair shop or garage is that you can continue with any project even if one motor or pump fails. Moreover, a duplex compressor is an ideal alternative when you don’t have access to three-phase electrical service. Our selection of duplex air compressors includes standard and elite models, but each unit we carry features all cast iron construction for long-lasting performance, magnetic starters, dual pressure switch controls, alternators, large tanks, and so much more. We offer motors ranging from five to 20HP in single or three-phase electric options. FSCurtis models are environmentally friendly with no oil vapor generated by the compressor, eliminating oil changes and disposal costs down the road. BelAire models are factory tested at full pressure to ensure satisfaction and running quality. When you shop at Best Buy Auto Equipment for your next air compressor, you can also expect automotive-style rod bearings, wrist pins, concentric ring valves, splash lubrication, finned coolers, two-year warranties, ASME certifications, and other great benefits. If you have any questions about our inventory, shipping, or need help finding the right solution for odd jobs and your pneumatic tools, contact us today for further assistance.